Syntax error detection — did you forget that ) ? Logical error detection — did you forget that var? There’s a whole bunch of stuff JSLint will pick up for you. I have talked before about JSLint in the context of SpiderMonkey, but, nowadays, I install node.js for a few things. 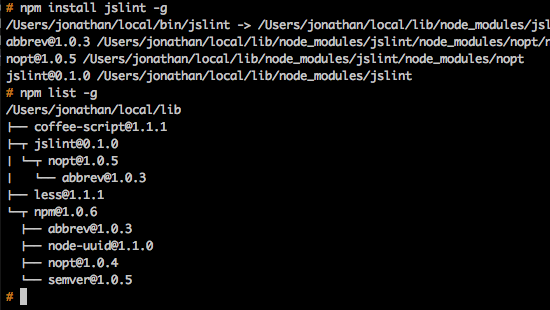 If I run JSLint through node.js, that means I won’t have to install SpiderMonkey anymore. I admit, these pieces of software are moving fast and the instructions (or lack thereof) are limited. But these things will vary with your OS and skill level. I’m going to focus on the Vim integration, but go ahead and install Node and install NPM. I recommend the simply named “jslint”. You can look it up on GitHub as node-jslint. Make sure you don’t forget that “-g” flag with NPM. NPM changed a lot in version 1.0. The main part of integrating with Vim to “compile” something is to set makeprg and errorformat (aka efm). If you ever need to integrate with something else, be sure to Google for those. :cw — open the quickfix window if there are errors. Close it if there are no errors. The variable makeprg is just was it invoked when you do :make. The variable errorformat are instructions on how to parse the error messages of the “compiler”. That variable and how to configure it are a whole world of complexity. I’ve talked casually about using Vim as a pager before. However, I’m still surprised to see how many people use Vim regularly and don’t know about this feature. Admittedly, it’s easy to overlook the hyphen in the explanation. Why Vim as a Pager? If you’re using Vim already, there’s nothing else to install. If you’re using Vim already, it’s already configured the way you like it. More importanly, Vim detects the kind of file it is being piped and turns on the appropriate syntax highlighting. Why page in black and white? In this case, “less” is definitely less! As a pager, you want to use Vim in read-only mode. What the difference? Vim doesn’t ask you to save the file if you try to quit. Of course, you can still modify and write the file … the -R flag is just a more reasonable pager default. You probably don’t want to set the PAGER variable. Vim doesn’t understand ANSI escape sequences. 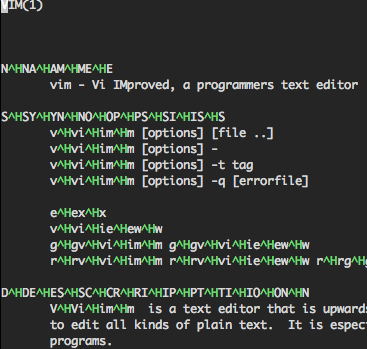 As such, a command like “man vim | vim -R -” won’t show colors; it will show escape sequences. I use less as PAGER. I use vim in explicit cases. The view command gets installed at the same time as vim. It’s just a symlink to vim. Using view is exactly like typing vim -R.
But I find that typing vim -R - is easier on my finger’s muscle memory.